Buy-in Small and Win Big With The Steps To Silks Summer Series! Calling all rounders to the Silks Poker Room at Tampa Bay Downs! From July 12-22, the Silks Summer Series deals you into the action in a series of tournaments worth a guaranteed $200,000! The main event of the Summer Series is a $125,000 no-limit hold 'em tournament starting Thursday, July 19. You can either post the full $400 buy-in, or win your way in through a two-step satellite process for as little as $30! On July 12, you can buy into a satellite event which can earn you a spot in Event #3 on Monday, July 16 (see below). Cards are in the air beginning at 7:00 p.m. and the buy-in is just $30, with an optional $30 add-on to double your stack at the beginning of the tournament. This is unlike a normal tournament, where play continues until one player has all the chips. Here, for every $150 spent on buy-ins and add-ons, Silks will give away a seat in Event #3. Play goes on until the number of players left matches the number of seats available. For example, if people spend a total of $3,000 on entries and add-ons, then play will continue until there are 20 players left. At that point, every remaining player wins a seat in Event #3 and the tournament ends. The first weekend event of Silks Summer Series has a $175 buy-in. It begins with four Day 1 flights on Friday, July 13 and Saturday, July 14. There are two flights per day, starting at 1:00 p.m. and 6:00 p.m. Everyone who lasts through one of the four Day 1 flights advances to Day 2 on Sunday, where the remaining players battle it out until a champion emerges. If you get knocked out of a Day 1 flight, you can still get back in the tournament! You can either buy in to a later flight, or you might be able to rebuy right on the spot. (The immediate rebuy option is available until Level 9 of the tournament begins.) If you make it to the end of more than one flight, you can pick your best surviving stack to take with you to Day 2. Event #2 begins at 1:00 p.m. on Monday, July 16. The buy-in is $125, with rebuys allowed until the start of Level 7. The added bonus in this event is a $25 bounty for each player you knock out of the tournament. This creates more action and puts short stacks in serious danger, as players try their hardest to felt them and pick up some extra cash. This event begins at 6:00 p.m. on Monday, July 16. There's a $160 buy-in, and contestants join the winners of the July 12 satellite to play for the money. Rebuys are allowed until the beginning of Level 7. Card players age 50 and over are invited to a tournament of their own starting at 1:00 p.m. on Tuesday, July 17. The buy-in is set at $160, and players can rebuy until the start of Level 7 if they bust. This event benefits the Jesse Heikkela Foundation for childhood cancer and neuroblastoma awareness. There's a $125 buy-in, which includes dinner before the tournament begins, and $30 of your entry fee benefits the Foundation. There are rebuys in this tournament, but you don't have to wait until you run out of chips. If your stack falls below 6,000 chips during Levels 1-4, you can buy another 2,000 chips for $20, all of which goes to the Foundation. (You start the tournament with 4,000 chips, so you can buy your way up to 6,000 immediately.) At the end of Level 4, everyone gets one last chance to buy 5,000 more chips for $20. All of those proceeds benefit the Foundation as well. This is a matinee event starting at 1:00 p.m. on Thursday, July 18. There's a $125 buy-in, and rebuys are allowed until the beginning of Level 7. Just like the bounty event earlier in the week, but with higher stakes. This tournament starts at 6:00 p.m. on Wednesday, July 18, with a $230 buy-in. Rebuys are allowed until the start of Level 9. Come out swinging in this event, because you win a $100 bounty for every player you eliminate from the tournament! The Silks Summer Series wraps up with the no-limit hold 'em Main Event, with a guaranteed prize pool of at least $125,000! Before we get into the full tournament details, here's how you can win a seat for as little as $30. Step 1 Satellite - Sunday, July 15: This satellite begins at 6:00 p.m. with a $30 buy-in. Players can also buy $20 add-ons before the tournament begins to increase their opening stack. For every $90 spent on buy-ins and add-ons, one seat will be given away to the Step 2 Satellite. For instance, if players spend $1,350 on buy-ins and add-ons, play continues until there are 15 players left, who each win a spot in the Step 2 Satellite. Step 2 Satellite - Thursday, July 19: The Step 2 satellite begins at 1:00 p.m. Everyone who won a seat in Step 1 advances to this satellite, along with anyone who wants to post the $100 buy-in. The satellite continues until 1 in 5 of the original field remains. At that point, play stops and all remaining players win a seat in the Main Event. You can also skip the satellites and post the $400 buy-in to go straight to the Main Event. There are five Day 1 flights in this event -- one on July 19 at 6:00 p.m., two on July 20 at 1:00 p.m. and 6:00 p.m., and two more on July 21 at 1:00 p.m. and 6:00 p.m. Everyone who survives a Day 1 flight advances to Day 2 on Sunday, July 22 to play for the big money! If you get knocked out of a Day 1 flight, you can buy in to try again in a later flight, or you can make an immediate rebuy up until the beginning of Level 9. If you make it to the end of more than one flight, you can pick your best surviving stack to take with you to Day 2. 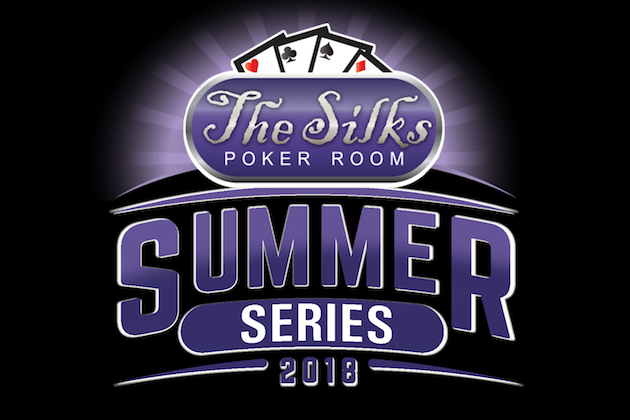 The biggest and best poker action in Tampa this summer will be at the Silks Poker Room during the Silks Summer Series. Come out to Tampa Bay Downs' poker room between July 12-22 and show your stuff, and you could walk away a whole lot richer! For more details about each event, check out the Silks Summer Series website. Yes, poker is a sport... and for more Tampa sports news, check out 813area.com. Make sure you sign up for free email updates and find out about all the biggest events happening around town!